Many tasks in Xcode can be quite time consuming: cleaning & rebuilding, UI testing, unit testing. Wouldn't it be convenient if you could step away and have Xcode send you a text message when it finished? 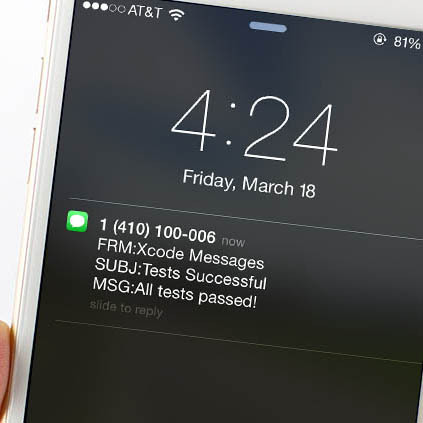 This tutorial will walk you through a simple setup for automated Xcode text messages. While there are a number of interesting & creative ways of receiving automated mobile notifications as part of your development workflow, this is one option which is easy (and fun) to set up in just a few steps, and demonstrates the possibilities of Xcode's customizable behavior options. To deliver the SMS itself we'll take a simple approach: email. Most carriers allow SMS delivery via email, so generating a text message is as easy as writing a script for Apple's Mail app. SMS delivery is dependent upon carrier & region, so check your plan or ask your cell provider if you have questions about compatibility or SMS charges. There are a number of approaches here but we'll take an easy path and use AppleScript to send the message from our default Mail account. All we need to do is set the basic properties (subject, message, and recipient address). If you'd like to further customize your email there are a number of Mail scripting examples online, but keep in mind that the email content which is actually deliverable via SMS is limited. osascript -e 'tell application "Mail"
set theSubject to "Tests Successful"
set theContent to "All tests passed!" Notice that we're actually writing a standard shell script, with the AppleScript as an argument to the osascript command line tool, since Xcode will execute our script with Bash. The example in this tutorial is a simplistic one, but this basic process can be custom-tailored for more complex workflows. Unique messages can be added for failing vs. passing tests, build success vs. failure, etc. The actual text message that is delivered will vary between carriers, but the end result is a convenient mobile notification sent from Xcode and delivered to your phone. Maybe not as funny as Texts From Xcode, but useful nonetheless! Happy coding.